Succulents make beautiful, thoughtful gifts and this easy guide will help you find the perfect presents for all of the special people in your life. Grown and designed with care, these succulent creations are easy to love and even easier to grow whether the recipient is new to plants or a succulent expert. Don't let yourself become overwhelmed by holiday shopping. Give a gift that cultivates joy! 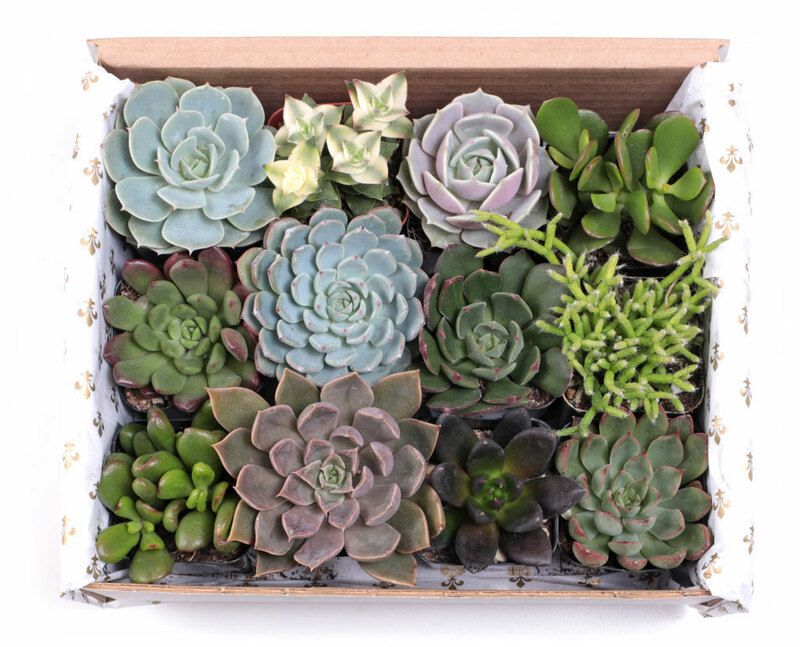 For a ready-to-go gift that's bursting with style, you can't go wrong with a succulent gift box. 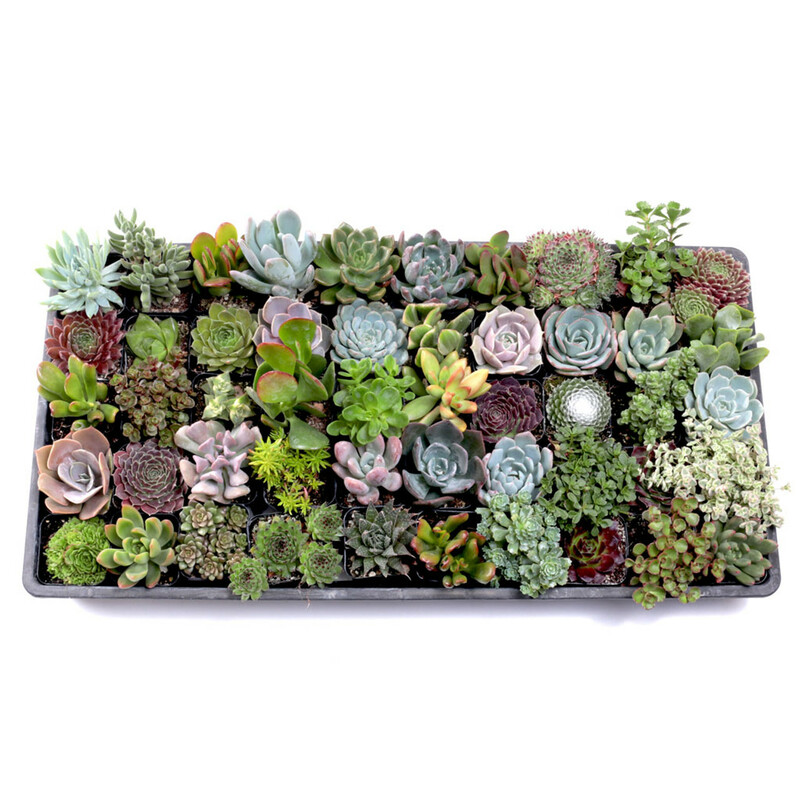 It includes a dozen tender succulents wrapped with tissue paper in a sleek white box. The mix is assorted and all twelve pots are labeled by species or cultivar. There's also a detailed care guide included, so it's novice friendly. Need a gift for someone who has everything? You can't go wrong with The Ultimate Succulent Club! 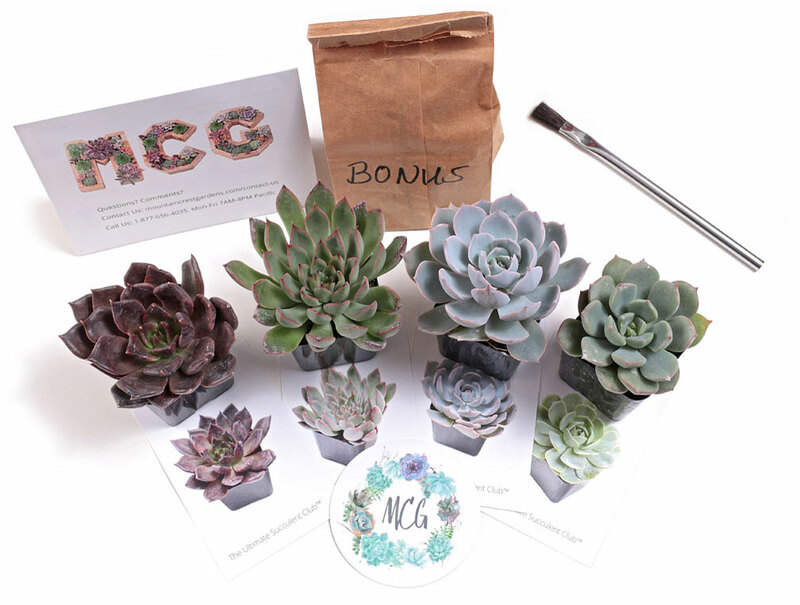 Your lucky recipient will receive four unique succulent plants each month. These plants will share a common theme that will vary significantly month to month. Examples of themes include color tones, seasonal varieties, ready to bloom, exotic forms, fuzzy textures, indoor growers, sun lovers, and much more. Themes are announced weeks before the ship date to give club members the option to skip a month. Each month's package also comes with a mystery bonus plant or accessory and collectible plant info cards. Many people don't know where to start with succulents, but we have just the thing! With our sampler trays, there's no need to decide - you get a little bit of everything. These trays feature plants in 2.0" pots and all varieties are different (50 for the Ultimate Sampler and 25 for the Super Sampler). Plus, every pot comes with an ID tag that includes the full plant name and hardiness rating. Last year these little guys were so popular we couldn’t keep them in stock! Our Tin Pail and Terracotta ornaments are filled with either earthy Sempervivum or pastel Echeveria rosettes that are incredibly easy to transplant in the new year. Know someone who loves Air Plants or just needs a super low-maintenance plant? We have two different styles of air plant ornaments (on wreaths or in terrariums), so you can help these lovely epiphytes find their way back into the trees. Prefer succulent rosettes on your ornaments? We have also added them to our grapevine wreaths. Sticking to our local roots here in the forests of northern California, we created wood slice rosette ornaments hung with jute for a natural, elegant look. You get to pick if you want a cluster of succulents or one large rosette! Our sister nursery, CalForest, grows trees for reforestation all along the West Coast. We borrowed some of their Giant Seqouia cones and thought, why not! Behold the trio Succulent and Seqouia Cone Ornaments, a tribute to our giant redwoods! Need to get a gift for your boss or your kid's teacher but don’t know what plants they like? What better gift to get them than a Mountain Crest Gardens Gift Certificate. You pick the amount and they get to decide if they want plants, pots, books, or anything else we have! We offer digital or printed certificates, mailed directly to your recipient! 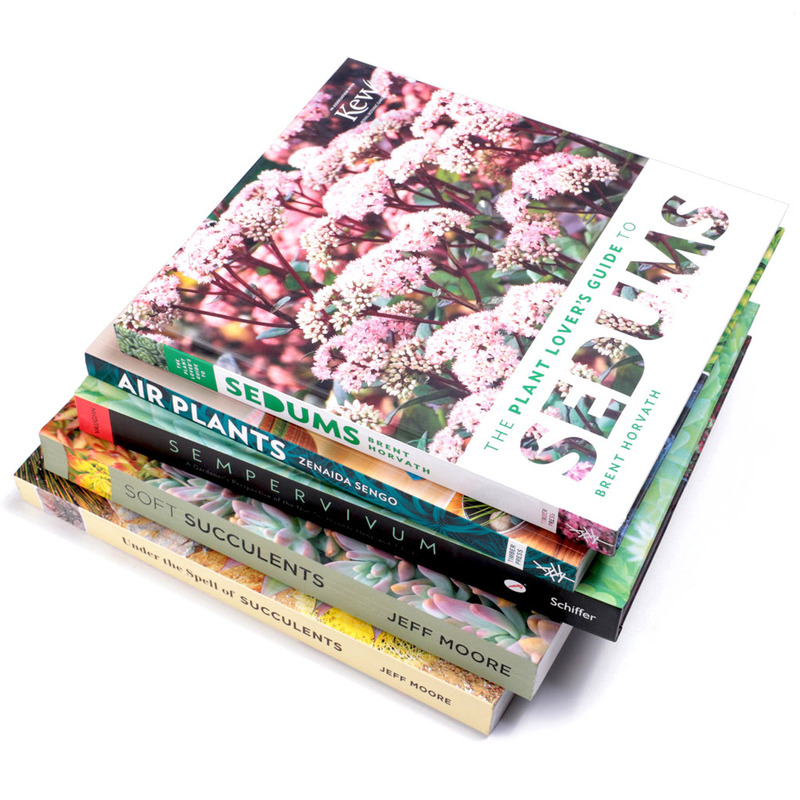 For people who already own and love succulents, what could be better than informative books full of beautiful photos of these charming plants. Our library includes a wide array of knowledgeable authors on topics such as care info for beginners, landscape design, indoor container gardening, designing green roofs, and so much more. A good number of our books are even on sale at the moment, so reserve a copy for you or a friend before they sell out! We hope we have helped you make some of your holiday shopping a little easier this year. Remember, you can pre-order your gifts now and we will send them whenever you request. We ship Mondays and Tuesdays and shipping is free for orders over $75 within the contiguous United States. From all of us at Mountain Crest Gardens, HAPPY HOLIDAYS!